Some users who updated to iOS 11 have discovered their battery life on an iPhone or iPad is running down faster than usual. Experiencing rapid battery drain after iOS updates can be frustrating, but often there are reasons why the iPhone or iPad battery is draining faster than usual after a system software update like iOS 11. We’ll cover a variety of tips and advice to help remedy battery drain after updating to iOS 11. One thing to keep in mind is that many people update to iOS 11 and then proceed to use their iPhone or iPad more often than usual to explore the new features and to tinker with the various changes made to the operating system. This can lead to a perception of faster battery drain, but really the person is just using the device more often than usual. Obviously the more a device is used, the faster the battery will drain. 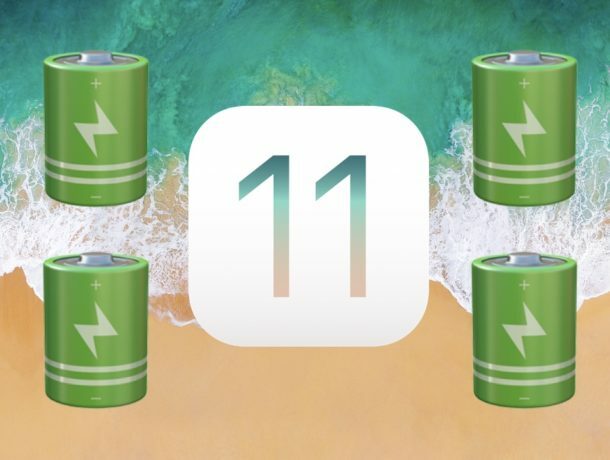 Nonetheless the tips covered here are not meant to address that type of battery drain, instead we’re covering some common features and reasons why iOS 11 may be running down a battery quicker than expected. Currently users can download iOS 11.0.1 for iPhone and iPad, an update specifically aimed at addressing bugs. Just updated to iOS 11? Wait! For users who just recently updated to iOS 11 and are now experiencing poor battery life, sometimes waiting a day or two is all you need to do to stop the battery drain. The reason to wait is fairly simple; iOS updates perform various system maintenance tasks in the background, including things like indexing of Spotlight, indexing Photos, Photo facial recognition scans, iCloud Library updates (depending on settings), and other background system tasks that occur when the iPhone is not in use. The best thing to after updating iOS is to leave your iPhone, iPad, or iPod touch plugged in when it is not in use for an extended period of time, like while you are sleeping. Do this for a few nights in a row (large capacity devices with significant storage usage take longer), and the system tasks should complete themselves, and battery life should improve on it’s own. Much like you can check to see what iOS apps are wasting your time, you can use the same battery setting to determine what apps are draining down battery and using battery life. If you see anything particularly egregious in the list of apps sucking down your battery, you can either quit those apps, update them (sometimes a software update can help if there is an app bug causing the issue), or uninstall the app completely if you’re not interested in maintaining it. Social media, games, location based, and media apps are often culprits of heavy battery consumption, as are messages with heavy usage of stickers and animated gifs. Hold down the Power Button and Home button concurrently together until you see the  apple logo on the screen. This applies to hard rebooting any iOS devices with a clickable Home button. Fo iPhone 7, iPhone 8, iPhone 7 Plus, and iPhone 8 Plus, hold down the Power Button and Volume Down button until you see the  Apple logo to reboot the device. Raise to Wake detects when your iPhone has lifted and turns on the devices screen in response. This is useful, but it also can run down battery life if you have the iPhone in hand and are fairly animated, walking, jogging, dancing, or otherwise moving around while the feature is activating itself frequently. Turn it off to save some battery life. If all else fails you can use Low Power Mode to save energy and prolong battery life. This turns off a few features like automatic mail checking, disables background activity, reduces screen brightness, and some other actions, but the result is a longer lasting battery. If you find iOS 11 battery life performance to be terrible and the above tricks failed (including to wait a few days while the device is plugged in, seriously do not skip that as it often resolves battery issues), then you can downgrade iOS 11 to iOS 10.3.3 on iPhone or iPad with these instructions here. No longer getting Field Test Signal on i-Phone 5 SE. Umm … errr…maybe the fix’s do not change for the same phone? be strange if they did when only one change was made, the IOS. Simultaneous too easy, Quadratic is not. I remember the 4s when it came out could be used as a coffee cup warmer. Things have gotten better since that time. I remember how you could go out to find “solutions” and find well meaning people giving advice pretty much canceling each other out and Apple silent as the grave for a month or two while developing the fix. It seems like with the volume of complaints that this is probably another time where they will need to work on a fix and it might take a while. A new iPad is overheating. An iPad Air has slowed down considerably as a result of updating to iOS 11. Yea same, my iPad Air 2 has been overheating ever since the update. Also, I have seen a drastic decrease in battery life. What a surprise…yet another problem with battery drain with a new iOS. You know what Apple is best at nowadays? Lowering expectations. I think this launch has finally pushed me to try something other than Apple since I’m tired of paying a premium for glitchy mediocrity. Could also be the fact that when you toggle Wifi and Bluetooth in control center in ios11 it doesn’t actually kill the radio. Apple themselves have mentioned this, WiFi and Bluetooth toggles in control center are not to Disable them, they are just toggles to disconnect WiFi or Bluetooth from current connections. To disable them, you have to go to settings app and disable them. Just sitting here reading this I’ve drained 5% power on my iPhone 7 plus. the auto-brightness setting / Sorry whoever wrote this article, but there is no auto-brightness setting in iOS11, I wish there was, it keeps dimming my screen and I can’t “turn it off”. I would rather have a bright screen at the sacrifice of the battery, but it keeps auto dimming… point us to that setting where you claim in iOS11 that you can turn it off. Yes there is an auto brightness setting in iOS 11. Once again consumers are confronted with launch problems which they themselves are expected to fix.Surely there should really not be any problems with a so called premium product?Quality Control seems to be non existent,’let the customers fix it’ attitude is NOT good enough!! I have witnessed this part, you should really wait a couple of weeks before you judge the battery on the new iOS. When I installed iOS 11 on Tuesday night, during Wednesday and Thursday, whenever I opened the Photos app into the (faces) section, I was getting the message (lock your iPhone and keep it on power to continue analyzing photos …) or something similar. I was sure the battery was being wasted due to the background tasks. Also, I believe that the ControlCenter change of the function of the WiFi/BlueTooth toggles added a toll on this. since the WiFi and Bluetooth won’t really be disabled, rather than just disconnect from current networks. I personally believe in a week time, the battery performance should get better .. and I hope apple adds the option to Enable/Disconnect/Disable the WiFi/Bluetooth toggles from ControlCenter. I was with you up til “have patience for new bugs…” I’m tired of having patience with lazy Apple developers creating crappy software. This is the most valuable company in the world with a crap ton of cash and they still manage to do a subpar job. Apple doesn’t create the best software/technology, they create the marketing. Name one piece of software, from any company, that doesn’t have a single bug at launch. I went to check the battery use by app. It turns out that my favourite app, Pinterest, is a battery hog, used over 50% over battery. You really can’t use it properly at reduced brightness. It was never a problem before I replaced the battery. I kept plugged in all the time. Now with the new battery, it slowly loses power when using Pinterest, despite being plugged in. I also use a iPad version of Photoshop. It definitely requires full brightness. Yet it didn’t turn up in the list of the power hogs. It might be because it has a black background for everything possible. Pinterest uses a white background. Not sure why this battery loses power. It doesn’t lose power if kept at lower lighting. It’s time to buy a new one, and pass this on to my granddaughter. With instructions not to use full power. Background colors don’t matter unless the screen is a OLED display. The OLED display has a different way of brightness for a screen, in which the colors matter for battery drain, and OLED is only available on the iPhone X. Every single iPhone/iPad/iPod uses a LED display. An LED display lights up every pixel on screen. Be aware that I am no expert in LED/OLED screens. What I have said is a defenition of ONLY WHAT I know, so if you’re interested, by all means go and find more about LED and OLED screens. Well iPhone 6+ only minimal battery drain, iPad Air is being hammered from the update, typical use before I need to hook up charge cable was 4 to 6 hours, now I am lucky to get 1.5 hours. I’ll try shutting off background app refresh if I don’t see improvement in the next week. I have normally been on the beta version but did not have the time over the 11 beta to be able to really help out so stayed away from. I expect that what I’m seeing is some of the conversion from the old iOS to the new one. I read, Skype for less than an hour a day, and play less than 5 games on my iPad Air. I always turn off everything, log off of everything, turn off the internet when done, and since the update my battery is constantly low with heat issues. It is nervousing. I keep thinking it might catch on fire 🔥!! Can it be uninstalled? I had major battery drain issues with my 6S Plus. Just upgraded to the iPhone 8 Plus and have no battery issues at all after 2 days of use. As one person mentioned, go to Settings and manually turn off Bluetooth. The update automatically turned on Bluetooth – and Wi-fi – so if you noticed it and used Control Center to turn them off, they aren’t really “off”. From past experience I know Bluetooth “on” will seriously drain you battery, especially if Wi-fi is on as well. The other bug I’ve noticed is the App Store keeps giving me notifications for updates that I already installed a day or two before. I don’t know the answer to this, except Apple will probably address it with a small update in the near future. Are the people who works in Apple stupid? This new update is just trash, you can’t even turn off bluetooth or wi-fi in the control center. “ Raise to wake” is wrongly named as the phone doesn’t wake. You still need to hit the home button for bringing up the number pad in order to unlock the phone. If it was truly raise to wake the pad should appear upon movement. After installing 11.0, my iphone 6 gets so hot using some apps that I keep a fire extinguisher next to me. I just updated to 11.0.1 hoping that a bug fix addresses the issue. Ha. If you think this is trouble, Steve Jobs would have thrown someone out of a window before releasing High Sierra in this condition. I was a beta tester and they never released a Gikd Standard. The last release was dreadful but the public release, hard to imagine, is even worse. The tech support guy at Apple, running HS, was unable to set a callback for me. Tim Cook better pray Jobs doesn’t come back as a zombie. I use my iPhone as a medical device so this is much more than an inconvenience or hassle. Does Apple understand there are now medical devices that need battery life! I’m really angry. This product was not ready for release because of this problem. Is it a coincidence that this happens about the same time a new iPhone debuts? i have an iphone 6 update and now it wont last me the entire day like it used to. so what’s up? how do i fix this? My iPhone Plus had amazing battery life. I would charge my phone at night and be set for the day. Now I’m lucky if I get 1.5-2 hours Before my phone drain to 10%. I know all the ways to help reduce battery drain.Knowing how to do it misses the point. Having to do it is the issue. Hands down iPhone 7 Plus had the best battery life of all its predecessors. Now, my iPhone is almost useless. Like others, I reply on my phone for work. Ironically, a big part of my job involves providing IT support to Apple users. I work in multiple environments and locations throughout a single day. I can not be tied to a wall charger. Please, don’t advise me to use my car charger and battery packs. I haven’t needed to rely on either prior to iOS 11! It’s frustrating that we the consumer need to take a self-care bandaid approach when Apple should making this a number one priority to fix. iOS was released prematurely…I didn’t drop my phone causing damage. I updated the iOS which has caused the “damage”. And I find the timing curious…Am I being lead (manipulated) to throw my hands up and say, “guess I should lay out a grand for the iPhone 8 Plus or X because user of iPhone 8 are not having battery issues!” ??? Sure fix for overheating issues, turn Off motion animations, ie the super cool zoom in zoom out from apps and folders. My SE cpu seems to use all its power just to do these animations, leading to overheat issues. I just brought an brand new iPhone SE this past Friday online and I got it in the mail yesterday. The phone was already came pre-installed with ios 11 :( My battery is going down much quicker then my old iPhone with either ios 9 or ios 10 which ever is was on. And I don’t use my iPhone a lot. Only for the basic stuff like call or text or the weather. I don’t even use it unless I get or have to make a text or phone call and the battery life after 24 hours would be at 90% or close to it. Today after the 1st day use my phone battery life probably gonna be down to somewhere between 90%-70% when I wake up. It at 94% now So I will be charging my phone more then before. Lucky my iPad Pro 9.7 is still on ios 10.3.3 and I not gonna to update because of the 32 bit app issue and battery life issue with ios 11. I play games on it sometime which some are still 32 bit and not updated to 64 bit yet or never will be. After downloading the update my iPad drains within a day after being fully charged. Now i can’t even seem to charge it, says not charging. My charge lasted for a week before when fully charged. What’s going on? I am not computer savy and i just use mine to read and do research. Any suggestions ? Thank You! Very frustrating because before the download worked perfect. What my experience was while I am using Google battery goes down drastically why it is like this any bug ? How can I fix ? Just shut phone completely off, turn on to make a call or use it for whatever and turn it off again immediately to save battery power. My iPad Air has had a massive loss of life since the update and screen freezes while on messenger. There is a reason for this and we are not stupid it’s for Apple to get us to buy there latest iPads. If this is not fixed I’m done with Apple and will never buy another product from a scamming company. There was nothing wrong with our battery’s till this update. I get 2 you tube short videos then it goes to charge. What a con!!!!! Buy samsung at least there honest!!!!! Ipad Air 2 dies all the time at anything less than 60% battery. It is just over one year old. I have to charge it twice to three times a day. Never experienced battery problems until the IOS11 update, was minor at first, now is getting out of hand. Battery drawing normally until 60%, after which I start to lose around 2-4% per minute, it because slow and laggy, dies continuously. Charging is slow, and it keeps draining until a full change is performed, and then the same repeats (normal until around 60%, then drains rapidly). Any ideas what to do? Turning down brightness and closing apps is not going to help here I’m afraid. Open the iPad Battery Settings section and see what is using your battery, it is likely an app or some task going wild in the background. I tis also possible the iPad device battery is going bad, which you can find out from Apple Support.